This article appears in print in the July 2018 issue. Click here to subscribe. When drinkers consider brown-hued spirits that have spent time in barrels, whiskey is the booze that usually comes to mind. But it hasn’t always been that way. In the 18th century, gin, too, was stored, shipped and sold in barrels—before it developed its current reputation as a clear, young, juniper-heavy spirit bottled in glass immediately after distillation. About 10–15 years ago, U.S. craft distillers started slowly experimenting again with aging gin in barrels, which means the spirit has spent some time in a wooden vessel after the distilling process. Since then, the idea of barrel-aged gin—sometimes also referred to as “cask-finished” or “dark gin”—has been seeping into the cocktail consciousness, and many Washington distillers are leading the way. Why did gin makers reverse course? When asking Washington distillers, you’ll hear a variety of explanations. For Seattle-based Captive Spirits distiller Ben Capdevielle, aging their Big Gins in casks allows the makers to “create different expressions,” and have “fun collaborations.” Micah Nutt, distiller for Seattle-based Copperworks, said they “wanted to learn as much as we could about the influence of casks on our spirits.” Edmonds’ Scratch distiller Kim Karrick was making a special holiday release and felt a gin accented by what she refers to as “baking spices” might “do well in the once-used rye and bourbon barrels.” While the specifics differ, there’s a thread connecting each answer—a creativity that leads our distillers, in their desire to delight consumers, to try different things. How does aging, or resting, in barrels affect gin? According to Whidbey Island’s Cadée founder and distiller Colin Campbell, this “is where the magic really happens.” Of course, it changes the flavor, but how it’s changed depends on the barrel and the time the gin takes up residence there (usually between two and six months, but longer on occasion). As an example, a new American oak barrel might mellow the juniper while adding the vanilla and caramel prevalent in bourbons. But many distillers employ barrels used once to age a different liquid, such as a bourbon, single malt whiskey, brandy, sherry and others. Copperworks even had a limited-edition gin that rested in barrels previously occupied by locally made Bradley’s Kina Tonic. In the manner of a fine whiskey, these gins tend to be swell solo sippers, or delicious when chilled with an ice cube or two, allowing them to breathe and shine. But they’re also showing up in cocktails on local drink menus, as creative bartenders discover their unique flavor combinations. Downtown’s Heartwood Provisions even partnered with Copperworks to create an exclusive cask-finished gin solely for the restaurant, one designed to pair with beverage director Amanda Reed’s house-made syrups, infusions and tinctures. 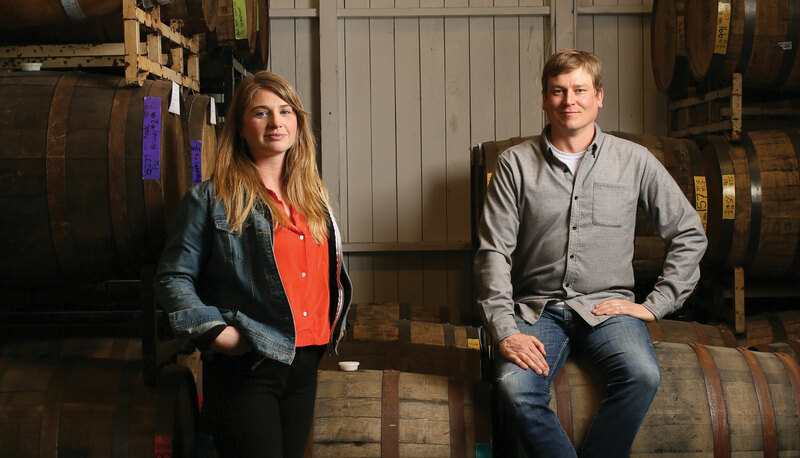 It’s all about the creativity, which is sure to have Washington distillers continuing to roll out the barrels—of gin. While the five gins below—available in local liquor stores and on the shelves of local bars—are a good start to shifting your “gin-scape,” there are other Washington barrel-aged gins, some ongoing releases and some limited-edition bottlings. To get up close and personal with the gin bounty and the boozy brains behind them, plan to visit the distilleries and talk to the distillers. I suggest first trying these gins solo, straight and with a little ice. This peat-barreled gin is rested for four months in barrels that previously held peated American single malt whiskey. The gin’s slightly vegetal wood and green aroma, and a finish of juniper, a wisp of orange, smoke and a little pepper, help it stand out. It’s wonderful to savor on its own, but it also holds hands cozily with other ingredients in cocktails, such as the Hugs and Sand (recipe at seattlemag.com). Captive Spirits also has a bourbon-barreled Big Gin and three-year barrel reserve Big Gin, with others coming. North Queen Anne, 1138 W Ewing St., Suite C; 206.852.4794. This distillery’s flagship new oak cask gin features notes of cinnamon, coriander, floral, vanilla and caramel. Its makers suggest trying it, and their many other cask-finished gins, in place of whiskey in classic cocktails such as the Manhattan and the mint julep. Keep an eye out for their limited editions (which recently included a gin finished in a cask that had held Sons of Vancouver No. 82 amaretto, and gins finished in casks once containing amaro, port, rum, mezcal and other spirits). Downtown, 1250 Alaskan Way; 206.504.7604. Aged in American white oak barrels that once held Cadée bourbon, this gin has botanicals on the nose, with a flavor containing hints of citrus fruit, juniper, vanilla, nuts and caramel. It’s nice over ice with an orange rind, and also in cocktails such as The Up-to-Date (recipe on seattlemag.com). Distiller Colin Campbell keeps a bottle in the freezer for straight sipping, which creates “a molecular explosion of flavor that you simply do not expect.” Cadée also has a more botanical aged gin on the way, and one aged in casks first used for Oloroso sherry. Distillery: Clinton, 8912 State Route 525, Whidbey Island; 360.969.5565. This gin is created using a recipe similar to the one used for the distiller’s Martini gin, but with more cinnamon, nutmeg and juniper; it’s finished first in oak barrels used once for bourbon, and then further aged in once-used rye barrels. The final flavor is one to relish, with lots of spices (those previously mentioned plus ginger, pink peppercorn and others) and vanilla that unveil as you sip. It’s worth trying both in whiskey cocktails like the old fashioned and in heartier gin cocktails like the Negroni. Edmonds, 90 Sunset Ave. S, Suite A ; 425.673.7046. A gin with a base of 13 botanicals and finished in oak casks that once held Oola’s own Waitsburg bourbon, this is a layered spirit, yet one that is still approachable and smooth. The nose starts with baking spices, juniper and honey, flowing into a maple sugar, pastry and vanilla flavor, with just a trace of pine and oak. Sample it first neat or on ice, and then in cocktails; a good option is the Martinez, in which the gin balances well with Italian vermouth, maraschino and aromatic bitters. Capitol Hill,1314 E Union St.; 206.709.7909. A.J. Rathbun writes about bars, spirits and cocktails for Seattle magazine and seattlemag.com, and is the author of 11 books, incluing the IACP award-winning Good Spirits. See more at ajrathbun.com.